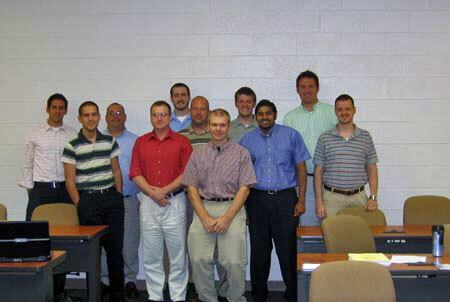 The fall semester at Detroit Baptist Seminary began on August 28. At this point, we have been in class for three weeks. 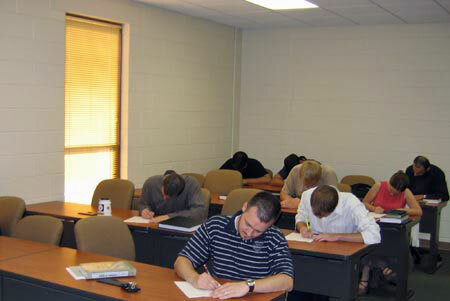 Here are a few pictures of the people in my class. The first picture is from my first year Pentateuch class. Do you see anyone you know? The following two pictures are taken of my Elementary Hebrew class as the students take one of the many quizzes that I have promised to give them. This is a diligent-looking group. In the second picture, can you identify the football mug in the picture? As far as Old Testament studies go at DBTS, the “iron men” award goes to the men taking Rapid Hebrew Reading. This is the most intense class that I teach. For those in the ThM program, a student is required to memorize all the words in the Hebrew Bible occurring ten or more times (approximately 2,150 lexemes) and to translate approximately 850 verses. 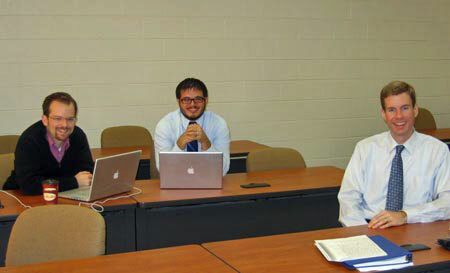 In the picture below, I caught the men in a good mood right after a rigorous day in class. How do you like the computers that two of the men have? The comparisons of Obama with Jesus Christ continues. You need to check out the brief video of the remarks by Tennessee Representative Steve Cohen from the floor of the House yesterday: Power Line: Stark Raving Mad. Besides having the most liberal voting record in Congress, Obama is also perhaps the most inefficient Senator. John Hinderaker at Power Line posts the hilarious exchange between Chris Wallace and David Axelrod on this past week end’s Fox News Sunday. 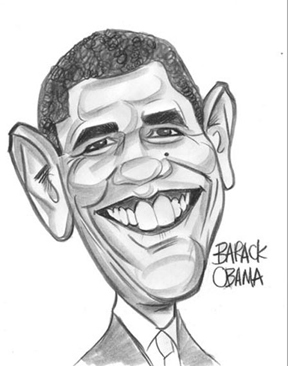 As more information is revealed about Obama, his message of change is hollow. Check out “Not Just the Most Liberal Senator”. 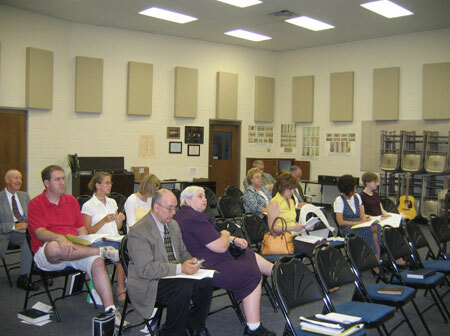 In response to the doctrinal compromise in the early chapters of Genesis, I have developed over the past ten plus years a seminary class on biblical creationism. As an outgrowth of this class, I have condensed the material of my seminary class into a series of six messages that I use at some churches in our area. On August 24 & 31, I had the privilege of conducting a Biblical Creation Seminar at Westside Baptist Church in Jenison, Michigan. The pastor and founder of Westside is Pastor Sam Hendrickson, a 2003 graduate of Detroit Baptist Theological Seminary (for more information about Pastor Hendrickson and his wife, Jill, go to the church website and click on the Pastor’s link on the left side of the page). 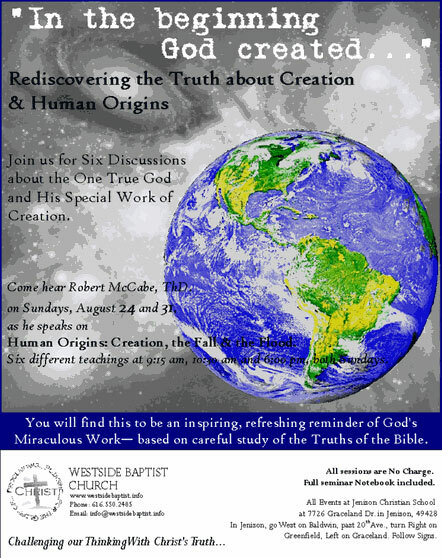 I gave the following six messages on Biblical Creationism at Westside. 1. What was the nature of God’s special creation? 2. When and how did death become a part of God’s created universe? 3. 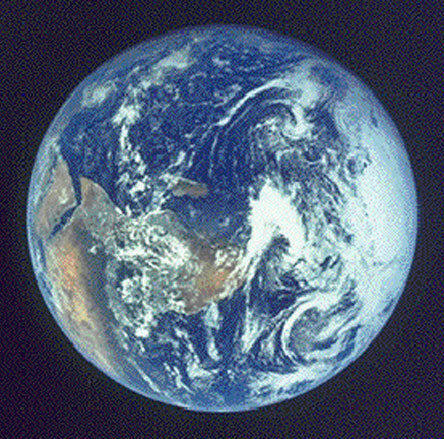 Is there a ‘gap’ between Genesis 1:1 and Genesis 1:2? 4. What is the nature of and result from the Noahic flood? 5. Why does God delight in His special creation? 6. What is the significance of creation, the fall, and the flood? My wife, Linda, and I had the privilege of getting to know some of the good people of Westside Baptist. On the last night of our meetings, we got a picture of some our new friends. While we were in Jenison, Sam and Jill showed us some of the highlights of Grand Rapids on Saturday, August 30. 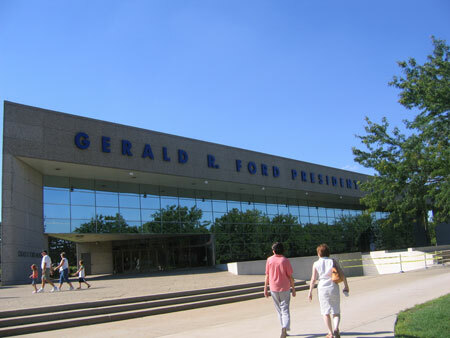 One of the places that we saw was the Gerald R. Ford Presidential Museum. I got a picture of the Museum as Jill and my wife walked towards it. 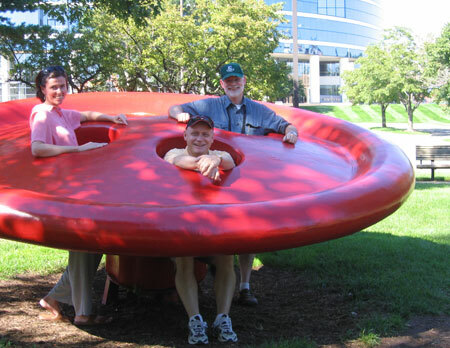 After strolling past the Museum, Linda took a picture of Sam, Jill and I in a big, tilted red button designed for children, as well as for those who are young at heart. We next walked a mile or two along the Grand River. While walking on the riverwalk, Jill took a picture of Linda and I. 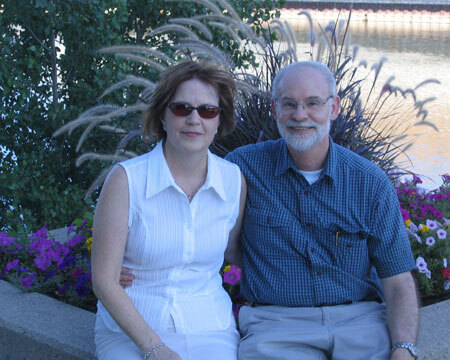 With this past August, Linda and I were able to celebrate 36 years of marital bliss. The Bible Conference in Jenison gave us a chance to slip away from Allen Park for a couple of days over the last two weekends in August. As you can tell, the years have been better for my wife than I. Not only did the seminar go well, but, as the above pictures reflect, we were able to mix a little pleasure with business. Both weekends were good on both account. This seminar gave us the opportunity to become better friends with Pastor Sam and Jill. As church planting has its ups-and-downs for all church planters, the Hendrickson’s face the same challenges as other church planters. Let me encourage you to regularly pray for them, as they seek to fulfill the Great Commission in Jenison, Michigan. On Wednesday night, I listened to the acceptance speech of Governor Sarah Palin at the Republican National Convention and last night to the acceptance speech of Senator John McCain. 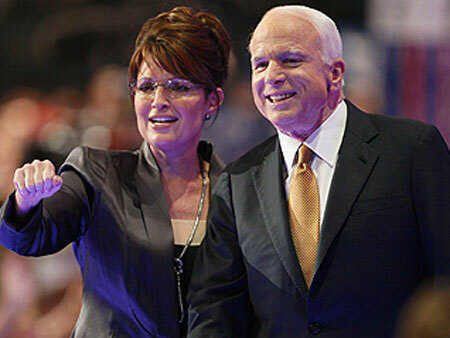 I must admit that my enthusiasm for McCain’s presidency campaign was minimal until last Friday, August 30, when he chose Alaskan Governor, Sarah Palin, to be his Vice-Presidential running mate. With McCain’s selection of Palin, this radically changed the dynamics of his campaign, as reflected by the soaring donations after his selection. While Democratic presidential nominee, Barack Obama, is known for his rhetorical skills, Governor Palin demonstrates in her speech that she can also soar in the heavenly realm as more than 40 million viewers observed. While I was mesmerized by Governor Palin’s speech, I was confidently satisfied with McCain’s speech last night. I believe he is a genuine hero and, as he reflects his beliefs and goals for America in his acceptance speech, he has the best interests of our country at heart. There are many facets of his speech that resonate with me. However, when he declares his commitment to appoint “judges who dispense justice impartially and don’t legislate from the bench,” I am convinced that McCain is the man who can best lead our country (for more click here). For a reasonable assessment of McCain speech last night, read “John McCain: Plain Spoken Heroism” by John Mark Reynolds. For those of you who are interested in Biblical Creationism, I checked out two interesting links this morning. Initially, I read the current issue of Acts & Facts. 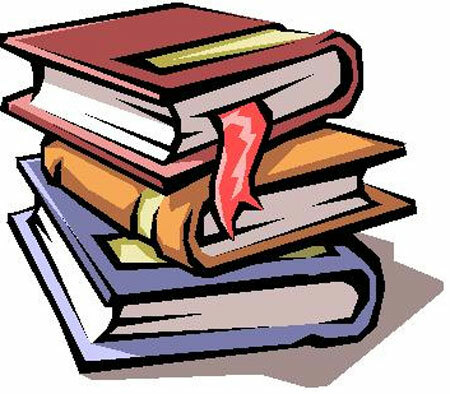 As always, there are a number of significant articles that I would recommend for you to read. Because of my interest in Biblical Creationism, the lead article, “Capitulating on Creation: Changing the truth of God into a lie” by Lawrence Ford, is a challenge to our generation since many evangelical leaders have compromised the literal and historical fabric of Genesis 1-2.